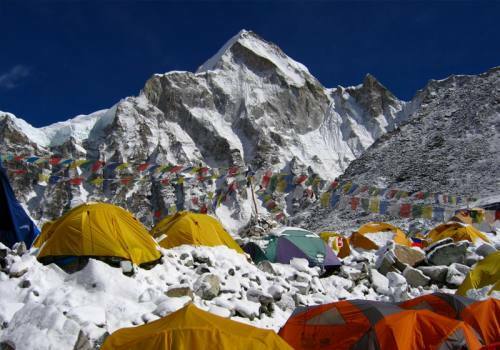 Everest Base Camp (EBC) Trek is one of the most famous trails in the world. For many trekkers, it is a dream to visit this majestic place. This trek leads us up to EBC, with an added bonus of Kalapatthar, which gives us incredible views. 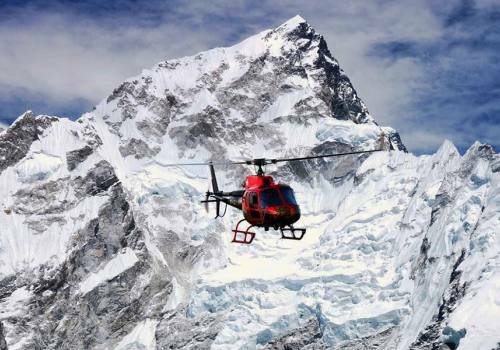 From EBC, we can see the infamous Khumbu Icefall, a necessary step in ascending to the summit Mt. Everest. 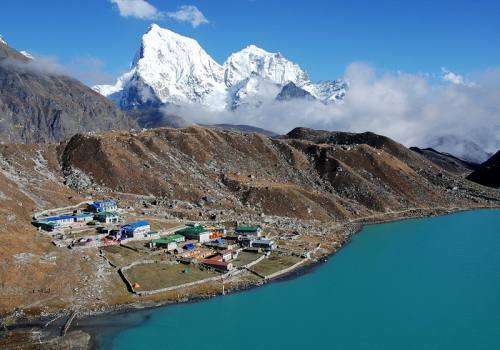 We'll also see Khumbu Glacier, the world's highest glacier. The massive peaks that are situated in Khumbu Region are Lothse (8511m), Cho Oyu (8153m), Ama Dablam (6856m) and countless more. 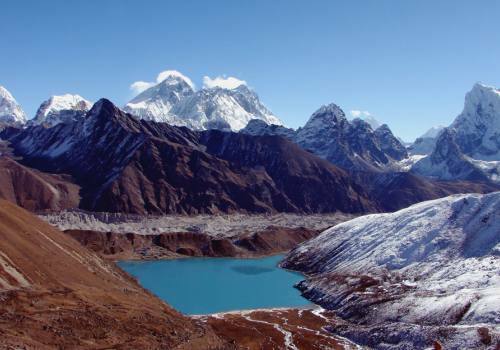 The Everest region contains the world’s highest mountain as well as an extra 200 peaks that are elevated than 6,000m. Everest Base Camp is well know for the gracious Sherpa people, who are exceptionally hospitable. They practice Tibetan Buddhism, which is obvious upon visiting the area, as there are many monuments to that religion along the trail. These all things make the trek more interesting and exciting. The places that Everest Base Camp to Kalapatthar Trek visits are: Kathmandu, Lukla, Phakding, Namche, Thengboche, Dingboche, Kalapatthar, Gorak Shep, Everest Base Camp, Lukla and Kathmandu. The total duration of the Everest Trek is 17 days and its maximum height is 5380m. The type of accommodation that it provides are either hotels or lodge. The means of transportation is by air or by land. In a same way the best seasons to trek Everest are September, October, November, February, March, April, May and June. Day 01Arrive in Tribhuvan International Airport, Kathmandu On the 1st day you will be transferred from Tribhuvan International Airport, Kathmandu to the hotel where we will brief you with the detailed itinerary. Overnight stay in a guest house. Day 02Sightseeing in Kathmandu Kathmandu Valley includes several UNESCO World Heritage Sites, including Pashupatinath, Buddhist stupa in Boudhanath. We can also visit Swyambhunath, also known as Monkey Temple, built in 2000 years old. Finally, we can visit Patan, city of fine arts. In the afternoon, you will be meeting with your trekking guide and will check all the necessary things. Overnight stay at the hotel. Day 03Flight to Lukla (2840m), Trek to Phakding (2610m) After a 40 minute scenic flight from Kathmandu to Lukla, you will trek to Phakding. Everest Base Camp trip begins at Lukla and follow Phakding, which takes approximately 3 – 4 hours. Along the way you can have a view of Mt Nupla (5885m) and Kusum Kangaru (6367m). Overnight in Phakding (2652 m). Day 04Trek to Namche (3440m) Starting from a slight rise to Jorsalle, the trail passes waterfalls and other cultural and natural attractions. During the day, you will be passing through the Sherpa villages viewing magnificent forests. Rhododendron trees, magnolias and giant firs provide a stunning backdrop to this part of the walk. En route you will be rewarded with their first glimpse of Kusum Kangru (6369m) Thamserku (6608m) Everest (8,848 m) and Nuptse (7879 m). (Weather permitting) a steep climb up the beautiful village of Namche Bazaar (3440m) which will produce more spectacular views and a comfortable place to spend the second night of the trek. Overnight stay at a guesthouse. Day 05Rest day Acclimatization is important before proceeding to a higher elevation. It is therefore recommended that you should take a short day's hike to Thame, Khunde, Khumjung or up to the Everest View Hotel so that we can see a clear view of Mount Everest. You can even relax and explore the culture of Sherpa in Namche. Overnight stay at a guesthouse. Day 07Trek to Dingboche (4410m) In the morning we'll have spectacular views of the mountains and the monastery in Tengboche. We will spend most of the morning in the Imjatse Khola through the birches, conifers and Rhododendrons. By following the river to the north, the path goes through several walls chortens and prayer flags around the small villages. On the way you can have the best view of Ama Dablam. After arriving in Dingboche, you can enjoy the beautiful array of fields surrounded by stone walls aiming to protect Barley, Buckwheat, Potatoes. The view of Island Peak is beautiful from Dingboche. Overnight stay at a guesthouse. Day 08Rest day On the 8th day you will be climbing a bit and then descending, in order to acclimatize. You can go for a short walk of 400 meters, ascending Nangkartshang Gompa in the north of the range, Dingboche from Nangkartshang which offers good scenic view. To see Makalau (8463 m), alternatively, you can follow an epic trail along the Imja Khola to Chhukung which may be longer walk taking 4-5 hours. Overnight stay at a guesthouse. Day 09Trek to Lobuche (4910m) On the 9th day we will continue our trip through the Alpine region from Dingboche and concluding in Luboche. On the way to Lobuche, you have to cross the frozen river in Thukla glacier and climb up the hill to watch the magnificent views of the Cholatse, Lobuche, Nuptse and Pumori. Overnight in tented camp. Day 10Trek to Gorak Shep (5153m) In the first section of trek we will start from Lobuche following the narrow space between the moraine of the glacier and the wall, then cross the tributary mountain glaciers to reach the dry lake bed known as Gorakshep. You will stop for lunch at the Gorakshep, then walk to the base camp of Everest and explore the area famous for the many climbing expeditions up to the Mount Everest. The Base Camp area provides an opportunity to experience the energy of the brave climbers of this famous mountain. After exploring the Everest Base Camp, we will be trek back to Gorakshep. Overnight stay at a tented camp. Day 11Trek to Kalapatthar We will leave early tomorrow morning on the 11th day and the weather is also bright and clear most of the time which helps when climbing Kala Patthar. 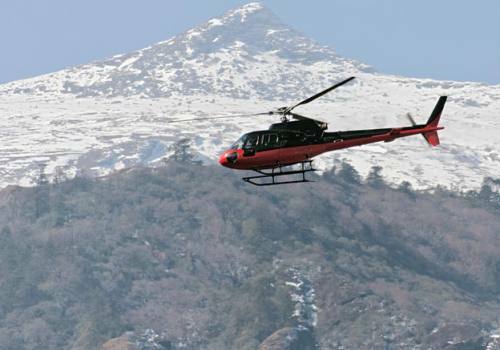 Today is one of the highlights of the trip, You will be rewarded with viewing a 360 degrees panoramic view of Mount Everest and surrounding mountains. Being back to Gorak Shep, you will have breakfast which is followed by a gradual descent to Pheriche to rest for the night. Overnight stay at a guesthouse. Day 12Trek to Tengboche On the 12th day we will trek back to Tengboche from Kalapatthar. In the first phase we will take our breakfast and will move for sightseeing. More or less, we will explore the surroundings so that we don't miss an important thing in this trek. Overnight stay in a tented camp. Day 13Trek to Monjo From Tengboche, we will trek back to Monjo. On this day you will trek to Syangboche. After that you will go down to Namche Bazar to take your lunch. Then, again you will carry on the trek until you arrive at the final destination. Overnight stay at a guesthouse. Day 14Trek to Lukla (2840m) On the 14th day you trek back to Lukla (2840m), which is a beautiful and easy walk and in addition it provides the view to Kusum Kangaru, blue pine along with Rhododendron forest. This is the last day of the trek in a bustling city so enjoy dinner with the team members. Overnight stay at a guest house. Day 15Flight to Kathmandu On the last day you will be thanking the porters, who were a crucial part of the trek. From Lukla, we will take one-hour flight back to Kathmandu. If the flight is on schedule, it is likely to be back at the hotel before noon and you can have a good shower and rest in the afternoon. We'll have a celebratory dinner in Kathmandu. Day 16Departure from NepalOn this day you will be transferred into Tribhuvan International Airport, Kathmandu after spending more than 15 days in Nepal so that you can return your hometown. I had a great time on this trek! My guide was very knowledgeable and attentive. My porter took good care of me. The experience, hospitality and cultural insight offered by this trek are beyond incredible and wonderfully inspiring. Like anything, the trek has its tough moments, mostly the day over the pass, but the excitement of reaching the top surpasses the demanding nature of the trekking at that point. I will never forget this experience and it will stay close to me forever. Thanks to Adventure Himalayan Travels and treks for organizing such a special trek for me. 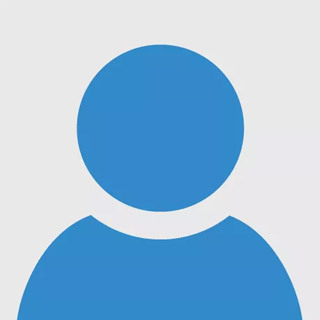 I will highly recommend booking with them.